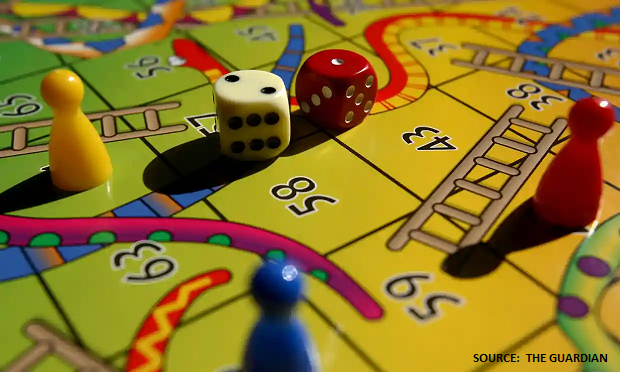 The Brexit debate had appeared to be a simple game of Snakes & Ladders till now. The Leave campaign landed on the ladders that led to its goal of No Deal, whilst the throw of the dice left Remain on the snakes, tumbling down towards irrelevance. “Captaincy is 90% luck and 10% skill. But don’t try it without that 10%”. The Brexiters should certainly have won by now, if we were playing Snakes & Ladders. They landed on a ladder early in the game when premier May set 29 March 2019 as Brexit Day. By default, this meant the UK would then leave the EU without a deal – unless a Withdrawal and Transition Agreement could be finalised before then. “Even if May can somehow achieve a deal with the DUP (the Democratic Unionists on whom she depends for her Commons majority), she would still have to agree it with the Leave enthusiasts in the Conservative Party. They are convinced that the real cost of Brexit will be borne by the EU27…. Today, it is clear that the DUP and the Tory Leavers will indeed vote against May’s Deal next week. So by now, the Leavers should be celebrating. But they aren’t. Somehow leading Leavers such as Boris Johnson, David Davis and Dominic Raab all managed to land on their own personal snakes by resigning from the Cabinet at critical moments. In life, as in cricket, one has to seize the advantage when it comes your way. This is where the 10% of skill is all important, as it tells you when to grasp the moment. 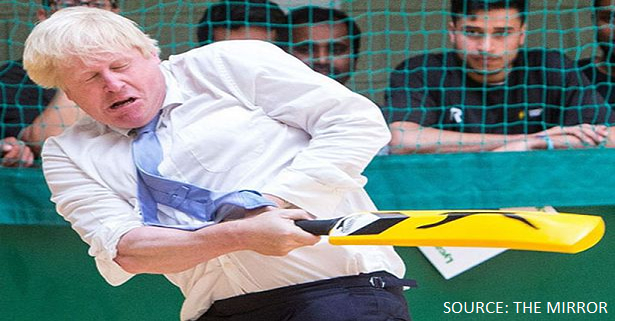 Clearly Leave, led by the former Foreign Secretary Boris Johnson, has so far failed to hit the all important ball to the boundary and secure victory. 3 Scenarios therefore seem possible over the next few weeks. A week is a long time in politics, but it seems relatively safe to say that May is unlikely to win next week’s Commons vote on her Withdrawal Agreement. Her aides, however, have been busy playing up the likely size of her defeat, suggesting she could lose by 100+ votes. And so, politics being politics, they will likely spin this as a success if she now loses by “only” 50 votes. In turn, this would probably enable her to defeat a motion of No Confidence, and then bring a slightly modified version of the Agreement back for a new vote in January. At that stage, it would be too late for any new deal to be agreed with the EU27. So if she then loses this second vote, the Brexiters will win by default. No Deal would become almost inevitable on 29 March. UK politics is tribal, as I have been told many times over the past 2 years by leading MPs from all parties. As such, it is very, very difficult for a Tory MP to vote to bring down their government. So if May does “only” lose by less than 50 votes next week, then it is also possible that the Christmas break would provide time for reflection and give her a small majority in a second vote. This, of course, would still mean the UK exiting the EU on 29 March. But in cricketing terms, it would essentially be a draw – where neither side could claim victory, due to the Irish “backstop” (originally a cricket term). In today’s Brexit version, it means that the UK would be bound to the EU unless and until the 27 agreed that the nightmare of a hard Irish border had disappeared. Scenario 1 is clearly the most likely outcome. But the current row over the legal advice being given to the government gives Remain the chance to build a solid opening stand in the battle for a new People’s Vote. In the background, however, is the key fact that an overwhelming majority of MPs voted to Remain. It is therefore not impossible that they could force a new referendum – particularly as the first was only “advisory”. Remain would then have to campaign positively on the issue of peace and prosperity – as I argued here in May 2016. But then, at least, the British people would have a real chance to decide on the future they wanted for themselves and their children.